Impedance matching of high-frequency components is a key part of antenna design that ensures maximum transfer of power between the antenna and the transmitter / receiver circuitry. Antennas can be tuned to resonate at the desired frequencies much more quickly and efficiently by first designing a matching circuit rather than by making modifications to the antenna's physical dimensions. 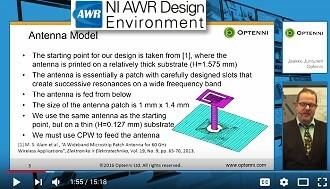 A new application example describes a unique design flow using NI AWR Design Environment Microwave Office for RF/microwave circuit simulation and AXIEM for planar EM analysis and the AWR Connected™ for Optenni third-party solution to design and match a 60-GHz printed antenna. The application example, Design and Matching of a 60-GHz Printed Antenna Using NI AWR Software and AWR Connected for Optenni, can be downloaded at: resource-library/design-and-matching-60-ghz-printed-antenna.